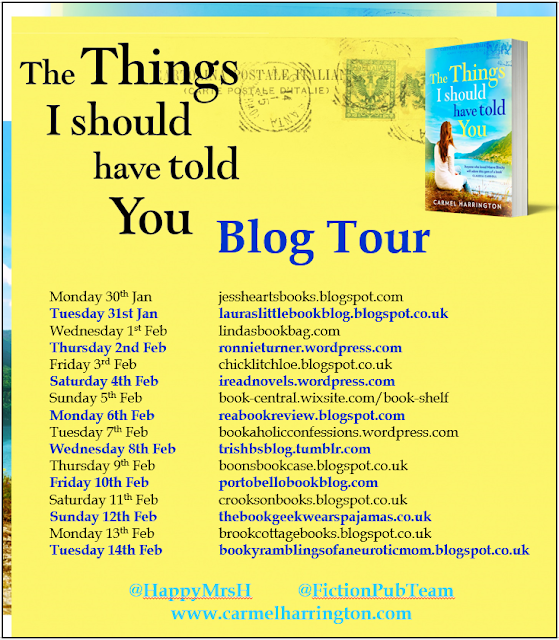 Today on Laura's little book blog, I am delighted to be part of the tour for The Things I Should Have Told You by Carmel Harrington. As part of my stop, I have an exclusive extract for you right at the beginning of the book and it definitely going to want you to read more Hope you enjoy! OLLY Our lives are just a series of moments. From the small, mundane occasions that we let pass us by without notice, to the big showstoppers that make us pause and take note. Then, when you least expect it, a moment so powerful and defining happens that changes everything in a split second. The thing about change is, it’s not always good. Today was a day of insignifcant moments, until Jamie’s scream bounced off the walls in our house and timeslowed down. Relief at seeing him in one piece was "eeting as I followed his eyes and saw what he saw. Evie, my thirteen-year-old daughter, lying unmoving, vomit splattered on her face and chest, dripping into a noxious puddle on the dark "oorboards. Time then sped up as we made our frantic dash to thehospital. And now we are in no-man’s-land as we wait for more news on Evie. A kind nurse has just left our cramped hospital waiting room and the musky, woody scent of her fragrance lingers in the air. Vanilla, apples, sandalwood. It’s Burberry perfume, I’d recognise it anywhere. I look to my right and am unsurprised that the smell has sent Pops right back to 1981 too. A time when it was the norm in the Guinness house to spray that scent into the air every morning, in an effort to bring someone back. Until one day the bottle was empty and Pops said, ‘That’s enough now lad.’ I watch him as his grey eyes water up and he turns to hold my gaze, nodding. A silent acknowledgement of mutual pain triggered by the scent of a nurse’s perfume. For maybe the one-millionth time in my life, and I daresay in my father’s, I yearn for my mother. MAE How long have we been sitting in this room now? It feels intolerable and I long to see my daughter. I seek out the clock on the wall and realise that it’s almost nine p.m. Three hours’ sitting in this small room waiting for news on Evie. Meagre updates from harassed but kind nurses and we cling to the fact that at least she’s alive. Panic overtakes me once again at the thought of any scenario that doesn’t include . . . I can’t complete the sentence. I continue bargaining with God. My mantra, my prayer, is simple – don’t let my baby die. I’ll do anything if you grant me this one thing. I’ll be a better mother, I’ll be a better wife, I’ll be a better person. Please keep my baby alive. Is this my punishment? Perhaps divine intervention from a higher level, stopping me from making a huge mistake. The thing is, it didn’t feel like a mistake earlier. It felt good. I look at my husband and wonder what would he think if he knew that when he called me this evening, I was in a bar with another man. And that five minutes before that, I had made my mind up that I wasn’t coming home tonight. OLLY Evie. I catch a sob in my throat before it escapes. Even so, Jamie hears it and looks at me, his little nose scrunched up in worry. I smile to cover it up. He’s scared enough without worrying about me as well. I glance at Mae, but she’s looking out of the small window, lost in her own worry and pain. Should I go over to her? I chicken out and decide maybe later. MAE My mind races. I cannot understand how Evie could end up in such a state. I peek up at Olly again, as that same irrationality that won’t stop plaguing me jumps up and hits me in the face. Shouldn’t my perfect house-husband have known that something was wrong? I want to scream at him again, ‘Why didn’t you see this coming, Olly?’ I know his answer to that baseless accusation would be, ‘What about you, Mae, where were you? Why didn’t you see this?’ And the weight of my shame makes me hang my head low. The blame sits on both of our shoulders. Somehow or other we’ve let our daughter down.